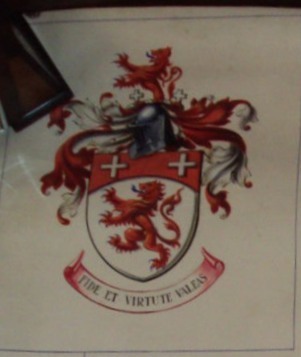 There have been three Grants of Arms sold on eBay by vendor thebizaar that relate to one family. The first of 1808, Sir Thomas McKenny Bt, I have already recorded. 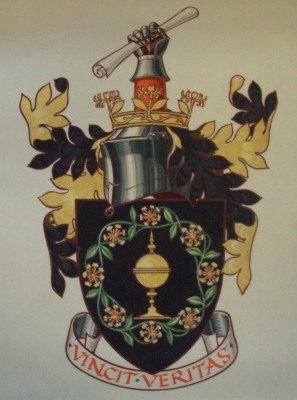 The second Grant of Arms (8th August 1905) was to Thomas KcKenny Hughes, grandson of Sir Thomas McKenny, and was sold for £102. Crest: A demi lion rampant Gules between two crosses couped Argent. 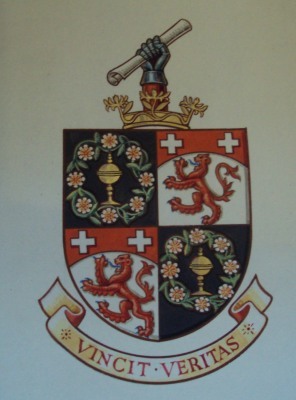 The third Grant of Arms (20th June 1955) was to George Ravensworth Hughes and sold for £112. George was Thomas KcKenny Hughes’ second but eldest surviving son. His brother was killed in World War One. Arms: Sable a covered cup Or encircled by a chaplet of Honeysuckle flowered proper. Crest: Issuant from a coronet composed of four sprigs of Honeysuckle the stalks cojoined and embellishing the rim Or a cubit arm vested Gules the hand gauntleted proper and grasping a roll of parchment bend sinisterwise Argent. In October 1995 George Ravensworth Hughes recorded a Declaration at the College of Arms that he would thereafter bear his Arms quartered with those of his late father. He also declared that he would only use the Crest granted to him. Arms: Quarterly 1st & 4th Sable a covered cup Or encircled by a chaplet of Honeysuckle flowered proper 2nd and 3rd Argent a lion rampant Gules on a chief enarched of the last two crosses couped of the field.